What can insect societies teach us about our own? Sure, we bug out from time to time, but we’re intelligent, and they’re not. Right? Well, it turns out that humans share common traits with ants, bees, and other insects. We even go to war in similar ways. This edition of the New Drone Order series will explore how drone technology fits into our world system, and question where it’s taking us, utilizing lessons from the realm of insect species to guide the topic, as well as an interview with an expert on insect societies and autonomous robotics. Propaganda, proliferation, global sales, the military industrial complex, and the concept of biomimicry will all be examined. Go on, read it, give it a chance! If you think you’re so different from insects, you’ve got ants in your pants. “One day when I went out to my wood-pile, I observed two large ants, one red, the other much larger, nearly half an inch long, and black, fiercely contending with one another. Having once got hold they never let go, but struggled and wrestled and rolled on the chips incessantly,” wrote Henry David Thoreau. Last year, Listverse.com published an article entitled "10 Surprisingly Human Traits Found in Insects". It turns out that dragonflies have selective attention. Bees can understand abstract concepts, do math, become stressed, and they react the same as we do to cocaine. Crickets display chivalry in combat situations when a damsel is involved. Ants have been shown to give less alert comrades lessons about locating food in what scientists claim is the first example of "teaching" to be found in the animal world. Springtails hitch rides on mayflies, and they don't even need to call up Uber. Insects build cities, herd other animals, and they also conduct traffic management and public health activities. They farm to sustain themselves just like we do. They make music, communicate in symbols, grow subterranean crops, enslave each other, and fight wars. What might surprise you is that these creatures have displayed characteristics of what we humans call “culture”. Culture is comprised of the artifacts and skills that are produced as a result of reasoning. Most people would not believe that insects are capable of reasoning, but research has shown that ants make rational decisions and learn from experience. Like ants, bees can make complex decisions at the group level based upon experience. If visitors from another star system had visited Earth a million years ago, before the rise of humanity, they might have concluded that leafcutter colonies were the most advanced societies this planet would ever be able to produce. Yet there was one step to take, the invention of culture, making it possible for humans to become the most dominant species on this planet. How much ARE we like them, exactly? Human brains are fundamentally just a more complex version of the insect brain, with many striking similarities and patterns of behavior. These include the use of exactly the same neurotransmitters, receptors and physiological processes! The scientific questions about ants and brains are the same ones we have about many other biological systems that function without hierarchy, such as the immune system, the communities of bacteria in our bodies, and the patterns we see in the diversity of tropical forests. For all of these systems, we still don’t understand how the parts work together to produce the dynamics, the history, and the development of the whole system. If an omniscient biologist viewed us under a microscope, watched us move, scramble and conglomerate over our abundant planet, would we be perceived as intelligent insects? Or perhaps foolish and naive ones, however advanced we may be - humanoid critters with large appetites for resources, ambitious to the point of volatility, possessors of creative, expansive, and destructive tendencies and impulses and dispositions. It turns out that for ants, as for humans, warfare involves an astonishing array of tactical choices about methods of attack and strategic decisions about when or where to wage war. Colonies that rely on scouts may kill fewer adversaries in total because a scout must return to its nest to assemble a fighting force—usually by depositing a chemical called a pheromone for the reserve troops to follow. In the time it takes a scout to assemble those troops for battle, the enemy might have regrouped or retreated. Ants that are less cavalier about loss of troops employ long-range weapons that allow them to hurt or impede the enemy from afar; for example, stunning their enemy with a Mace-like spray, as Formica wood-ants from Europe and North America do, or dropping small stones onto enemy heads as Dorymyrmex bicolor ants from Arizona do. Why is this relevant? That's easy. Drones. Since 2010, Obama administration officials have busily constructed a database for administering life and death. The “disposition matrix” as it’s called, contains a list of suspects targeted for elimination across the planet. These spreadsheets are now a permanent feature of U.S. national security. To avoid being massacred, some slave maker ants release a “propaganda” chemical that throws the raided colony into disarray and keeps its workers from ganging up on them. International agreements exist to specifically regulate a number of inherently problematic weapons, such as landmines, poisonous gases, blinding lasers, and expanding bullets, but no such regime exists for autonomous weapons. At the start of 2012, President Obama and his Secretary of Defense, Leon Panetta, unveiled a new national strategy built around the unmanned aerial vehicle and special operations forces. Troop numbers were cut by as much as 100,000 as part of a restructuring to create a “smaller, leaner” military that would no longer engage in large-scale counterinsurgency. The giant hornet is the only species of hornet known in which individuals gather together and then attack other social bees or wasps en masse, fascinating behavior displayed by an extraordinary predator. But one of its prey species doesn't take too well to being bullied. The hornet's foraging strategy sounds like a four-phase military exercise. The first step in the giant hornet's feeding sequence is raiding. Then comes phase two, recruitment. The hornet rubs secretions from a special gland onto the area surrounding the honeybee nest. The secretion is a pheromone, a chemical compound used in communicating specific messages to its own or other species of animals. Detecting a pheromone is like having a sixth sense for chemical awareness. And the chemicals deliver information. In this case the hornet's pheromone is a signal for other giant hornets to amass and attack. Parallels: Drone strike initiatives in foreign countries have all taken place in the shadows, and they collectively set a dangerous precedent that may soon be emulated across the globe by a range of state and non-state actors. The drone war waged inside of Pakistan’s tribal areas for eight years appears to be in direct contravention of international humanitarian law on numerous fronts. What happens when countries don't take too well to being bullied? They will respond with force when they have the means, and they may have total disregard for proportionate retaliation. If autonomous robots are replacing the role of humans in warfare, then where will accountability lie when something goes wrong? Should we be concerned about the development of autonomous systems if reliance on them could result in a situation where nobody can be held accountable? As weapons systems are given increasing autonomy in order to respond to threats which humans may be too slow to respond to, in ways which are too complex for humans to control, it becomes even less realistic to expect human operators to exercise significant veto control over their operations. The tension between what we really know about ants—that no ant directs the behavior of another—and the familiar metaphors for social organization, permeates not only our stories about ants, but also the scientific study of ants. These contradictions appear in biologist E. O. Wilson’s novel Anthill (2010), which tells the story of an extended war involving three ant colonies. In Anthill, the ants are greedy, and their lack of foresight and unchecked consumption depletes their resources and causes them to perish. Anthill blurs the lines between science and fiction. Wilson’s scientific account of colony organization quickly becomes entangled in contradictions as he depicts ants as the passive and uncomprehending pawns of their mother, yet, at the same time, making decisions based on an almost-human intelligence and sophisticated understanding of their colony’s history and what it means for their future. Many times the ants are described as programmed, propelled by an “instinct machine.” At other times, the ants are said to have agency but are compelled to sacrifice for their mother, the “fountainhead” of the colony, and go obediently to their deaths. These little robots whose every move is dictated, sometimes by some internal program and sometimes in allegiance to the queen, are also, by contrast, savvy and purposeful enough to plan out their tasks in advance and engage in military strategy. When we figure out how ants run their colonies, will we learn anything that will help us to run human society? It is true that as people become more as we rely more on ant-like interaction networks such as text messaging and email, we can say that, in some ways, some humans are behaving more like ants. Consider the patterns in the network of your email correspondence, including all the people you sent email to last week, and all the people to whom they sent email, and so on. There are some hubs of repeated interactions and some links that went one way, once, and will never connect you and that source again. Such ant-like networks are now being used in telecommunications, robotics, and advertising. For example, the recommendations on an online store informing you that customers who bought x also bought y simply track the patterns of purchases rather than antennal contacts. But though we humans can be in some ways ant-like, ants are not like us. It takes a work of fiction to give ants identity, feelings, and motives that we recognize as human. For ants, only the structure of the network matters. For us, the content is crucial. We care about what the emails say; the ants care only about how often they get them. As we move through the networks that shape our lives, we constantly produce a narrative about what is happening and why. We may be wrong about what we think is going on, but it is vitally important that we think we know. Insect pheromones = tracking devices? The Navy has a $450 million contract with Blackbird Technologies, Inc. to produce beacons to track suspected terrorists. Kris Pister, a professor at the University of California at Berkeley, was sponsored by the Defense Advanced Research Projects Agency (DARPA), the Pentagon's R&D branch, more than a decade ago to work on smart dust and was able to create sensors the size of rice grains. In the beginning, he now says, he and his colleagues imagined "smart burrs" that could attach to a target's clothing as he or she brushed by, or "smart fleas" that could jump onto their targets. Pister says that this kind of autonomous microsensor is probably still not feasible. In 2001, however, his group succeeded in scattering more primitive smart-dust motes from a small aerial drone and using them to track vehicles. Native Japanese honeybees can detect the hornet pheromone, and they understand the message being sent, something akin to deciphering an enemy code. The bees modify their behavior by increasing the number of defenders at the nest. The first hornet to attack is greeted by a swarm of more than 500 bees, which form a large ball around the intruder. Civilians are being "terrorized" 24 hours a day by CIA drone attacks that target mainly low-level militants in north-west Pakistan. Rescuers treating the casualties are also being killed and wounded by follow-up strikes, says a report by Stanford and New York Universities. According to research by Nick Turse, the U.S. military operates 1,100 bases across the planet. Eventually, countries being victimized by drone strikes may be capable of developing their own drone technology, and retaliation could be a possible scenario in a classic case of the chickens coming home to roost, only in this instance, it would be larva coming home to hatch. It could be decades from now, but targeted killings which result in civilian deaths are breeding resentment. Every hoverfly has its day. The native Japanese honeybee evolved a counterstrategy, developing an effective defense against the predator. The introduced European honeybee did not evolve in a system requiring such a response. Hence, as a species they are essentially helpless against the warlike tactics of the giant hornet. 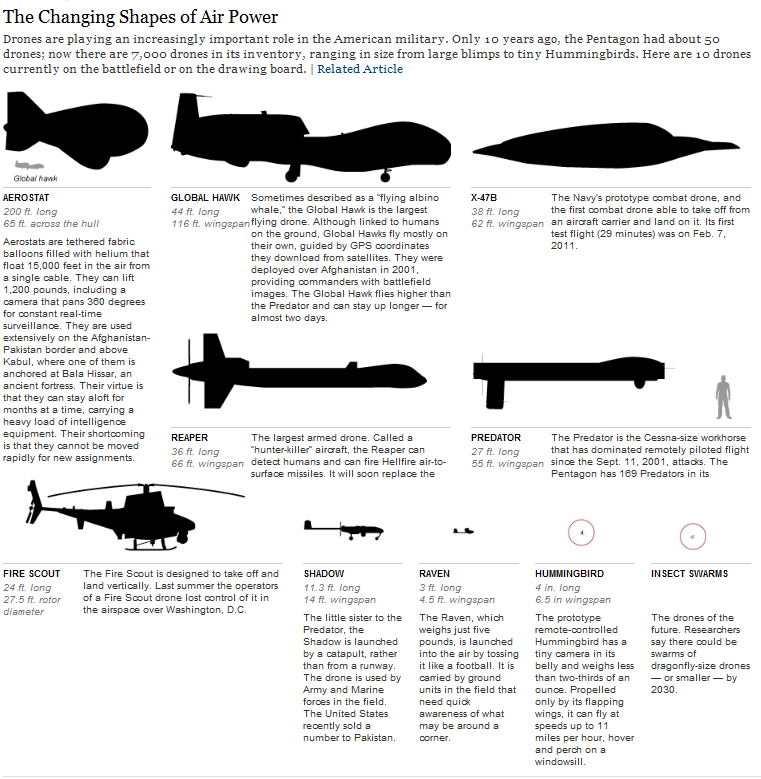 Predator drones have been manufactured with more efficient killing and surveillance mechanisms. New models are coming out yearly, such as the Predator C Avenger (appropriately named). What happens when Yemen, Somalia, Pakistan, and Afghanistan are able and determined to launch counterstrikes against those they deem terrorists? Human folly isn't exempt from the laws of nature, some of which are echoed by insect warfare. We should take heed before we over-breed, and proliferate beyond our means. Once our honeycombs are overrun by the machines we've created, concepts like the disposition matrix could evolve into a hazardous hybrid, and all that's sweet and prosperous could be endangered. U.S. industry has long been looking to open up overseas markets to its drone technology, said Huw Williams, an expert in unmanned technology. "There's a lot of customers who want this sort of capability and US industry has been looking to sell its systems. Reaper and Predator drones have been very successful in British and American hands, and a lot of people have wanted that but not been able to get access to it." As well as European nations, potential customers include India, Gulf States such as Saudi Arabia and Asian allies such as Korea, Singapore, Taiwan and Malaysia. Data from the International Institute for Strategic Studies identifies 56 different types of UAVs used in 11 different countries. Where it can calculate actual stocks, this covers 807 drones in active service around the world - and this is a huge underestimate: number data is not available for China, Turkey and Russia. The proliferation of armed drones in other nations is indicative of the platform’s increasing strategic significance as countries recognize UAVs as a valuable war fighting tool that will play a vital role in future conflicts. What the opening of the civilian airspace will do to robotics is akin to what the Internet did to desktop computing. The field was there before, but then it boomed like never before. For instance, if you are a maker of small tactical surveillance drones in the U.S. right now, your client pool numbers effectively one: the U.S. military. But when the airspace opens up, you will have as many as 21,000 new clients – all the state and local police agencies that either have expensive manned aviation departments or can’t afford them. The possibility of an Iran nuclear deal depressing weapons sales was raised by Myles Walton, an analyst from Germany’s Deutsche Bank, during a Lockheed earnings call this past January 27. Walton asked Marillyn Hewson, the chief executive of Lockheed Martin, if an Iran agreement could “impede what you see as progress in foreign military sales.” Financial industry analysts such as Walton use earnings calls as an opportunity to ask publicly-traded corporations like Lockheed about issues that might harm profitability. Hewson replied that “that really isn’t coming up,” but stressed that “volatility all around the region” should continue to bring in new business. According to Hewson, “A lot of volatility, a lot of instability, a lot of things that are happening” in both the Middle East and the Asia-Pacific region means both are “growth areas” for Lockheed Martin. Rising tensions in the Middle East have prompted governments to go on a shopping spree for American lobbyists and weapons. DefenseOne reports that over the next five years, “Saudi Arabia, United Arab Emirates, Kuwait, Qatar and Jordan are expected to spend” more than $165 billion on arms. And in the U.S., concerns over ISIS and Iran have prompted calls for an increase in the defense budget. Lockheed Martin’s trademarked slogan is “We never forget who we’re working for,” which Lockheed likes to suggest means Americans in general and military veterans in particular. The January earnings call indicates that Lockheed in fact answers to very different constituencies. The mutual, symbiotic relationship between military services and industrial corporations has given rise to the concept of the military industrial complex, which, in the United States, is composed on the military side by the Air Force, Army, Navy, and Marines. On the industry side, it is composed of about two dozen corporations. The largest of these defense contractors are those engaged in the production of aircraft and missiles. In the 1990s, most of these merged into three large groups: Boeing-McDonnel Douglas, Lockheed Martin, and Northrop Grumman. A crucial link in the military industrial complex is the elected political officials, especially those who sit on the congressional committees dealing with the armed services and who vote the authorizations and appropriations for weapons systems. They benefit from having weapons contracts given to firms in their districts or states, and they both pressure or support the military in the awarding of these contracts. Some observers consider the congressional committees to be as important to the process as the military services and the defense corporations, and speak of the other three elements as an ‘iron triangle’. The Pentagon now has some 7,000 aerial drones, compared with fewer than 50 a decade ago. Within the next decade the Air Force anticipates a decrease in manned aircraft but expects its number of “multirole” aerial drones like the Reaper — the ones that spy as well as strike — to nearly quadruple, to 536. Already the Air Force is training more remote pilots, 350 this year alone, than fighter and bomber pilots combined. “It’s a growth market,” said Ashton B. Carter, the Pentagon’s chief weapons buyer. Lockheed Martin's Intelligent Robotics Laboratories unveiled "maple-seed-like" drones called Samarai that also mimic nature. U.S. troops could throw them like a boomrang to see real-time images of what's around the next corner, the Navy Times reported. It could also be "useful for the military and police" to look inside buildings. But nano-biomimicry MAV design has long been studied by DARPA, who in 2008, hosted a discussion on "bugs, bots, borgs and bio-weapons." The University of Pennsylvania GRASP Lab showed off drones that swarm, a network of 20 nano quadrotors flying in synchronized formations. Vijay Kumar, an engineer at the University of Pennsylvania, along with Arizona State University biologist Stephen Pratt, came up with three applicable lessons learned from ant swarms to be used on fleets of quadrotors. 1) In nature, ants act autonomously. Engineers traditionally use a centralized system to choreograph movement in swarms, Kumar says. As a swarm grows larger, the control algorithms become increasingly complex. Instead, Kumar tries to program his aerial vehicles with a common set of instructions; the quadrotors divide up tasks and assume complementary roles. 2) Individual ants are interchangeable. “If I want to scale up my swarm, maintain the predictability of its behavior, and make it robust, the gang has to be able to perform the task if an individual is knocked out,” Kumar says. So he makes his aerial vehicles identical to one another. 3) Ants sense their neighbors and act on local information. Kumar outfitted his vehicles with motion-capture systems, cameras, and lasers that enable them to avoid obstacles and maintain a set distance from each other. As a result, they can fly in tight formations, work together to pick up heavy objects, and collaboratively create a map of their environment. The Center for Bio-Inspired Solar Fuel Production – funded with a $14 million Department of Energy grant – focuses on unlocking the secrets of energy conversion in photosynthetic organisms and will use these natural processes as a model for creating an artificial system of solar-powered fuel production. Paragraphs like this are commonplace in an evolving world. Biomimicry is a new science that studies nature's best ideas and then imitates these designs and processes to solve human problems. The term, which predominantly refers to industrial products and products based in biology, wasn't known until the 1990s, when Janine Benyus, co-founder of Biomimicry 3.8, wrote the book "Biomimicry: Innovation Inspired by Nature." Lockheed Martin, the world's largest defense contractor, is fond of biomimicry, citing it as a way of improving existing technology. As can be seen on their Advanced Aeronautics page on their official website, “how can we improve the human-machine interface using data analytics and biomimicry?" "Biomimicry is looking at how you can use Mother Nature as a measure. It is looking to the biological system and seeing where you can find guidance and inspiration," says Airbus senior manager of flight physics research David Hills. It involves studying how nature solves problems and formulating solutions that are "free from the trappings of civil aeronautical design." Boeing is also following the science of biomimicry closely - so much so that it has sent teams of engineers on field trips to the rainforests of Costa Rica to take inspiration from their surroundings for use back at the design table. The trips were organized by the Montana-based Biomimicry Guild, a consultancy which specializes in guiding companies towards finding solutions to their engineering problems by studying the natural world. A study from Point Loma Nazarene University calls biomimicry "an economic game changer" representing possibly $300 billion of U.S. GDP annually and 1.6 million U.S. jobs by 2025. Bharat Bhushan, director of the Nanoprobe Laboratory for Bio and Nanotechnology & Biomimetics at Ohio State University, estimates that the revenue from the top 100 biomimetic products totaled $1.5 billion between 2005 and 2008. Biomimicry can additionally be applied to solve complex social issues by understanding insects. The conference Social Biomimicry: Insect Societies and Human Design investigates lessons learned from bees, ants or termites and what could be translated into biomimetic design. Businesses have become fascinated by intelligent swarm performance of ants, bees and termites and have translated these into mathematical models. Unilever, McGraw-Hill, and Capital One have improved their efficiency on task division, organization of people, and plot strategy based on ant-foraging techniques. If you check out MAST’s (Army Research Lab’s Micro-Autonomous Systems Technology Collaborative Technology Alliance) mission statement, you can see how the concept of robot-soldier teaming fits into biomimicry on a macro scale, the end goal being mechanical combat multipliers that are able to act as a team with human beings and follow their commander’s intent. The Center for Biologically Inspired Design interviewed Janine Benyus, the mother of biomimicry, asking her: "What will prevent humans from, as you say, "stealing nature's thunder and using it in the ongoing campaign against life?" That's a good question, because any technology, even if it's a technology inspired by nature, can be used for good or bad. The airplane, for instance, was inspired by bird flight; a mere eleven years after we invented it, we were bombing people with it. As author Bill McKibben says, our tools are always employed in the service of an ideology. Our ideology, the story we tell ourselves about who we are in the universe, has to change if we are to treat the living Earth with respect. Right now we tell ourselves that the Earth was put here for our use. That we are at the top of the pyramid when it comes to Earthlings. But, of course, this is a myth. We've had a run of spectacular luck, but we are not necessarily the best survivors over the long haul. We are not immune to the laws of natural selection, and if we overshoot the carrying capacity of the Earth, we will pay the consequences. Practicing ethical biomimicry will require a change of heart. We will have to climb down from our pedestal and begin to see ourselves as simply a species among species, as one vote in a parliament of 30 million. When we accept this fact, we start to realize that what is good for the living Earth is good for us as well. If we agree to follow this ethical path, the question becomes: how do we judge the "rightness" of our innovations? How do we make sure that they are life-promoting? Here, too, I think biomimicry can help. The best way to scrutinize our innovations is to compare them to what has come before. Does this strategy or design have precedence in nature? Has something like it been time-tested long enough to wear a seal of approval? If we use what nature has done as a filter, we stop ourselves from, for instance, transferring genes from one class of organism to another. We wouldn't put mammalian growth genes into a potato plant, for instance. Biomimicry says: if it can't be found in nature, there is probably a good reason for its absence. It may have been tried, and long ago edited out of the population. Natural selection is wisdom in action. Tucker Balch is a former F-15 pilot, co-founder and CTO of Lucena Research, Inc. and professor at Georgia Tech whose research focuses on topics that range from the understanding social animal behavior to the challenges of applying Machine Learning to Finance. His online course, Computational Investing Part I, is the top online course offered by Georgia Tech with over 175,000 students enrolled. His work has been reported in Institutional Investor, the New York Times and the New Scientist. Tucker has authored over 150 technical papers, journal articles and books, including the recent book What Hedge Funds Really Do with Philip Romero. He is also interested in the integration of deliberative planning and reactive control, communication in multirobot societies, and parallel algorithms for robot navigation. Throughout his academic career, Tucker was intrigued by the challenge of applying Machine Learning and Artificial Intelligence to investment decision-making. He is also Vice President of the Robocup Federation, an international scientific initiative with the goal to advance the state of the art of intelligent robots. Lastly, he is the President of Georgia Robotics, a non-profit that manufactures and sells robots for education. I had the chance to speak with Dr. Balch, and here's what he had to say. BFP: Thank you for taking the time to speak with us today. This may seem an abrupt first question, but I wanted to know, what is your opinion of U.S. drone policy? Tucker: Drones are a powerful and important tool because they enable the US to engage on foreign soil at low risk to human life. I believe that aggressive use of drones in this way is a good idea. However, I believe also that we need more US troops on the ground in these risk areas as well. Most drones at present are remotely controlled by a human. They are not autonomous (or AI controlled). BFP: Has the work you've done in the robotics field had any influence on the bigger picture of autonomous robots? Tucker: My research is about coordinating multiple autonomous robots. The US isn’t ready technologically to unleash teams of non-human robot weapons. So no, my work isn’t yet influencing policy. BFP: Popular media has portrayed artificial intelligence as a pertinent and rising science that also poses some risks and consequences. You've been in the labs. You've seen the technology and worked with it for decades. Can you really see a robot going rogue? Tucker: We’re lucky if we can get autonomous robots to barely work. There’s essentially no chance that they will gain free will and try to hurt us. More likely ways that AUVs might become dangerous is if: 1) They break while in flight and accidentally deploy weapons on the wrong people, or 2) Someone hacks them and aims their weapons at the wrong people. BFP: In your research involving ants and other insects, have you seen any indication that we are not so different from these tiny creatures? Tucker: In my lab we try to model the intelligence of social animals by pretending that they are robots. We then use special algorithms to reverse engineer what the robot program is. This works as long as we’re looking at just part of an ant’s life: A simple task like foraging. In a similar way, we could pretend that people are robots and try to learn how they drive in traffic. We’re able to build just about as good a model of people driving as we can of ants foraging. However, we’re not able to learn the *whole* program for an ant or a person, just a small snippet. BFP: What can we learn from them? Tucker: Individual insects have apparently simple programs, and they execute them separately. Yet somehow when behavior is considered at the colony level, the colony seems intelligent. As an example, you know how traffic jams seem to move in waves of stopping and starting? This would not happen, it wouldn’t be a problem if we all drove slowly. Ants seem to have learned this lesson already. Ants rarely have traffic jams. BFP: Following your career as an F-15 pilot, you moved into the robotics, A.I., and machine intelligence fields. What was that transition like? Tucker: I get bored after doing one thing for too long. I tend to change careers about every 10 years. I view each new career with the same excitement I felt when I graduated from Georgia Tech and moved to my first job in California. But I bring the knowledge of what I did before to each new field. BFP: Let's say the most advanced and ambitious of A.I. strategies come to fruition during the next century. Can you envision a peaceful century, or an uncertain, tumultuous one? Tucker: There is a possibility that these technologies will be accessible mostly to the wealthy and that they will serve to further expand the wealth gap. I hope that we can find ways for AI to be available to everybody. I hope we find ways for robots to help everybody. If we can do that, it will be a peaceful century. BFP: How might multi-robot societies fit into this paradigm? Tucker: The main idea about multi-robot systems is that you can solve a problem (possibly) more easily with lots of cheap robots than a single expensive one. As a simple example, we have 4 sweeping robots at home and we let them all go to sweep at the same time. Our floor gets cleaned much more quickly. There are other ways they can help each other more intelligently as well. Erik Moshe is BFP investigative journalist and analyst. He is an independent writer from Hollywood, Florida, and has worked as an editor of alternative news blog Media Monarchy and as an intern journalist with the History News Network. He served in the U.S. Air Force from 2009-2013. You can visit his site here. Fantastic article, the implications of which are simply staggering. A thought, on an article i’d read years ago, popped in to my mind. It regarded a bee keeper from a little leafy village in England, who passed away. On the day of his funeral, local villagers noticed that a swarm of bee’s attached themselves to the side of his house. There is much to learn, programming willing empathy would be useful. It’s more rewarding if it’s natural though. OK, but ”bottom line… ” Check out the old classic: ”Forbidden Planet”… and you know, that is something that resonates, big time thinkers have covered this territory long ago… maybe we in the now times, would do well to read or, even justt think, use the ol’ imagination or wtf… ? I mean: FCS’s, there are more humans alive today than ever lived”!!!! So, why do we need to put people out of labor/work, we should not have machines doing what humans have historically done… like till the ground, etc. etc. etc. There is more human muscle available today… pushing iron weights in some gym…. ! Put those Guido wanabees to work on the farm!!! And as to ”drones”, well drone is word for worker bees, and worker ants, for one thing… and well, I doubt that our little ant farm… I mean our little collection of dweebs… ! Dweebs!, asexual type Geeks! The ones who tireously work down there in silicone valley, to make horrible inventions because thay hate people! I mean what the F do you see when you look at them mfr goons? Tee shirt wearing pantywaiste twerps! Who probably hate their fathers, if they even knew ’em! So these so called ”Drones”, don’t even worry too much, ’cause, de insects are allready invented, and they do just fine, thank you!, oh, excuse me, where is that damned fly swater at? OR, so to say, there is nothing new under the Sun, and I don’t think man can invent better bugs to bother us.